Gather your members or friends to join the GVG event. Special Rewards for those winners and consolation prizes for the non-winners. Registration will start on July 22 to August 12, 2017. Elimination will be on August 18 and will start at exactly 6PM (PH Time). - Guild participants must form a team of 6 members, each member representing a different battle style or character class. - To register, a guild representative, please follow the example below and comment/reply on this topic. Note: A character can only be registered under one guild and only one Character per account are allowed. - First Eight teams to register with 6 members (WA, WI, FB, FA, BL and FS) each will have a chance to join the elimination. - All the Participants who will join this event will use a Devil Set (+7 Armor, +10 weapons, including Epaulet ONLY) which are all located at Starter Set NPC. No need to extend slots, only those that are present at the Starter Set NPC can only be used. - Bring your own Devil Starter Kit before the event starts. - No accessories, bike, pet, avatar costume and title effect should be used during the event. (Please note that we will check your items before the event starts, Failure to do so, leads to a disqualification). -Admin will lock your equipment one day before the actual tournament, make sure that you already wear those items that are only allowed. - Three minutes preparation time will be given to all participants before the match. - The tournament will be conducted in the Graveyard area of Desert Scream. - Order of matches will be determined on the day of the tournament itself. 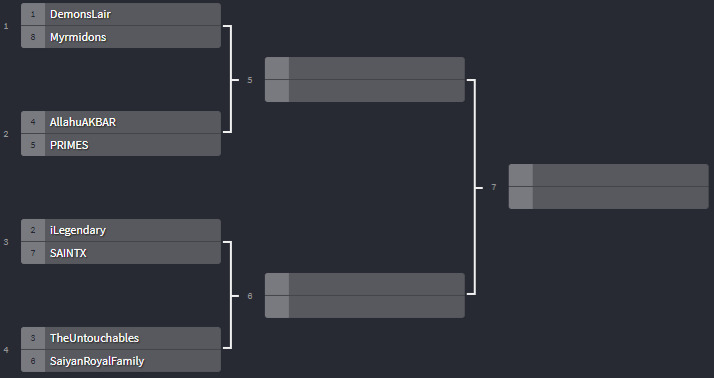 - The tournament is single elimination until the Semi-final round. - For the championship round, we have 'best of two rule' wherein the first team who won 2 rounds wins. - Match style is Guild War. To win, the Guild must reach 6 kills. - Participants must temporarily leave their home guilds to join the guild headed by the tournament facilitators (GMs). - Use of Normal, Single/Transcender and Party Buffs are allowed. - Holy water potions are allowed. - GM and SFC buffs are forbidden. - A dead character must resurrect in the Desert Scream town and is not allowed to resurrect by using an Odd Circle. - Once the player is dead on the battlefield, They are rendered out of the fight and cannot join in the war with their guildmates. - All participating teams must be present during the tournament. Those who are not in the event area during the general schedule will be disqualified. - The required kill count is six (6). - Dead characters will not be allowed to resurrect or fight back until the current round is finished or their team loses a match. - If there are remaining characters after the game time, the most number of team members will win the match. If the remaining number of team members is equal, there will be a sudden death match. - If one of a member of the participating team gets disconnected, the said team member can reconnect and join the match until it is finished. If all the participants disconnect the match will be reset. If a participant disconnects on purpose, his/her team will be disqualified. - Marshal/GM decision’s is final. - Participants are expected to be online at least 15 minutes before the start of the event. - The team line-up you have registered in your comment/reply is FINAL and CANNOT BE CHANGED. - No substitution will be allowed. In case of absence, the match shall proceed with only the remaining team members. - The match will end once all members of a team have been wiped out. - The use of any third-party program or exploitation of existing or previously unknown bugs or glitches is strictly prohibited. - Teams caught using any of these illegal activities will be given a warning. - Repetition of said infraction will disqualify the team in the Guild war tournament. - Appeals or complaints must be brought to the GM by the Team Captain immediately. - No complaints will be entertained after the GM has announced the winner of the match. - All other conditions/issues that may arise during the event (which are not covered here) will be decided by the GM in-charge. - Participants are not allowed to move out of the graveyard area during a match. - Willful violation of this rule will warrant a warning on the first infraction and tournament disqualification on the second offense. - The excessive use of foul language will not be tolerated. - Offenders will be warned on the first offense and will be removed from the tournament should he/she continues to display unruly behavior. - Deliberate disruption of the event by either the participants or the spectators will be dealt with accordingly. - The decision of the GM is final and non-appealable. - Tournament mechanics may change without prior notice. Note: Follow the rules to avoid disqualification. Basics are important.Learn from your Mistakes. Learn to forgive and forget. GAME ADVISOR LEADER at (NA) AKC. Are all debuff skills allowed? "May all your bacon burn"